Max’s Wine Dive recently sponsored a tasting of their upcoming spring menu for Houston foodies, food bloggers and assorted culinary hangers-on. 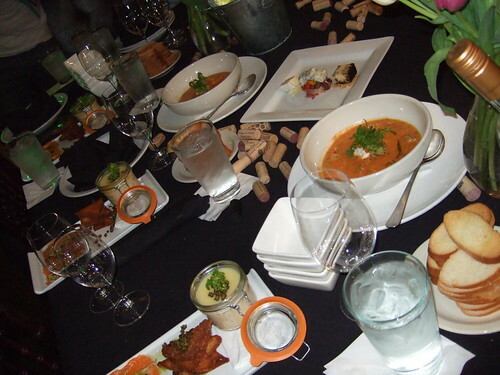 The tasting, including food and wine, was provided free of charge. These are my impressions and suggestions based on my experience. This was my first visit to Max’s Wine Dive. I was familiar with The Tasting Room wine bars that dot the upscale Houston landscape and was aware that the same company owned Max’s. Max’s prides itself on a fusion of upscale wine chic with a dive bar vibe. The concept works well as evidenced by the packed bar and tables on a Wednesday night. So far so good. On to the food. The menu items presented by Chef Michael Dei Maggi were clearly meant to showcase the seasonal flavors and “weight” (light, refreshing) of the dishes. Chef Michael came out guns blazing with a classic spring/summer dish — a chilled gazpacho soup. 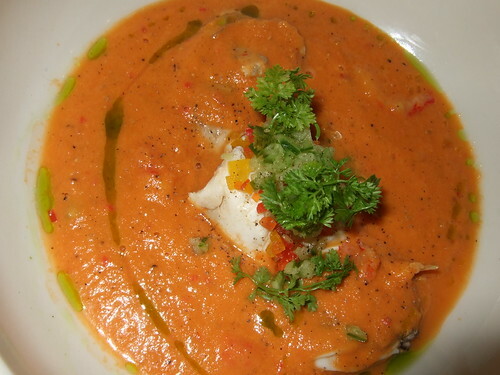 This “Gulf-Spacho” was a traditional gazpacho with chunks of seafood mixed in. The liquid was superbly seasoned and spiced, just the right texture, with the cucumber and tomato making a refreshing and cool base for the zing of the multi-colored peppers. The seafood added an extra dimension of texture if not of flavor — only the oysters could match up flavorwise with the sharp gazpacho while the fish and shrimp chunks were filling but overwhelmed by the liquid. I’m really enjoying the two and three-way dish trend. 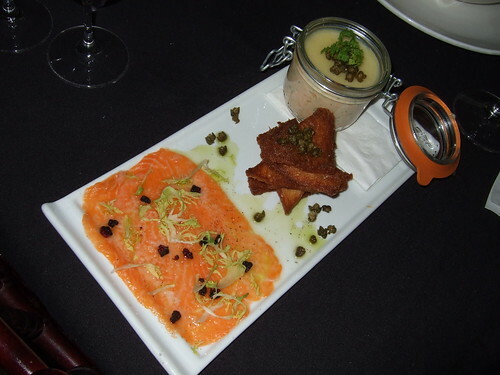 In this appetizer, the “Salmon Twice” was a carpaccio of salmon and then a nicely creative rillette of salmon. A rillette is basically a meat or fish that is seasoned/cured and then blended in fat until tender and creamy, chilled, and then used a spread or pâté on toast or chips. This rillette had a cap of what appeared to be clarified butter, which you had to break through and dig down to get to the salmon. A bit fussy for my taste but I liked the creativity. The salmon carpaccio was supremely fresh (it had to be, there’s no masking bad raw fish) with a light/sweet vinaigrette. This was the Cheese Course appetizer. Honestly, by this time the crowd at the dining table had reached a point of rapacious frenzy so I did not get a good taste of this dish (silly foodies! what can you do?). 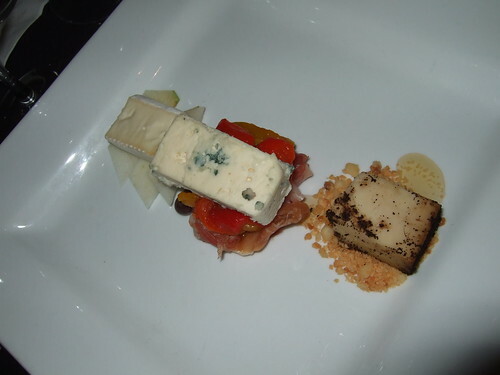 There were several different cheeses — sharp, creamy, mild, etc. — with proschiutto and other garnishes. Intriguingly, I kept hearing whispers about the espresso/lavender rubbed cheese. I just sipped my wine, scribbled a few notes and waited for the next course. 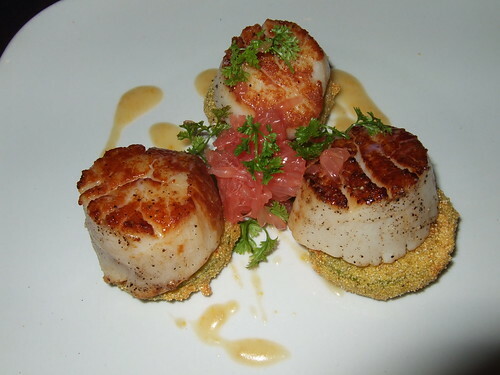 The last appetizer was the “Whistle Stop Special,” made up of New England diver scallops perched on top of fried green tomato discs and garnished with red grapefruit and lemon butter. For me this may be the perfect summer dish. I always equate spring/summer with seafood — crawfish boils, climbing out on a jetty with a bucket of chicken necks to fish for crabs, standing waist deep in the Gulf surf and casting out for flounder. These scallops were nicely seared and seasoned, tender and juicy. The lemon butter, fried tomatoes and grapefruit offered a great sweet/tart accompaniment. 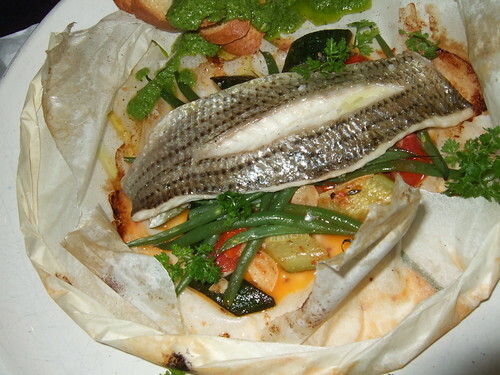 After some reflection, and at the insistence of one of my dining companions, I’ve concluded that the “Brown Bag Bass” was the best dish of the night (especially in the context of a spring/seasonal menu). First off, cooking/steaming fish in a pouch or bag is a superior cooking method. Then when you throw in some veggies and aromatics, the fish gets a complex infusion of flavor. Great presentation too if you crack open the pouch at the table. The whole thing just becomes one big pile of flavorful, subtle, and seasonal goodness. Such was the case here. Additional depth of flavor was introduced by a luxurious garnish of herbe pistou (basically a rich pesto without the pine nuts) with crostini and olive oil. The herbe pistou was so good it almost distracted from the subtlety of the fish! Roast chicken is a crowd-pleaser year-round. And we all expect a big portion of mashed potatoes to come with it, but in this case the accompaniment was exquisitely seasonal — artichoke, spring bean and sweet corn succotash. 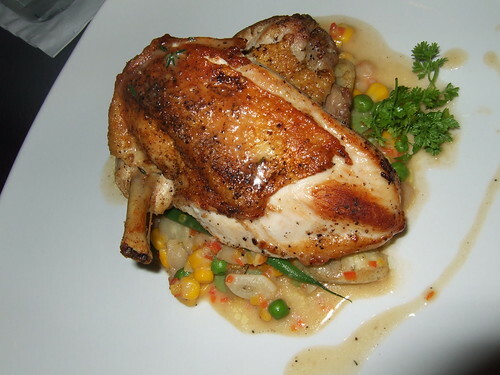 The chicken skin was crispy and crunchy on the outside, the meat inside tender and juicy. Again, there is clearly a focus on quality ingredients — I really hope this quality is made available at all times and to all customers and not just for this tasting. It’s hard to make steak frites seasonal. But it doesn’t need to be. People like me who crave steak frites don’t give a flip if it’s hot or cold outside. We just want our goddamn steak frites. So by nature this was the least seasonal dish of the bunch. The steak I sampled was cooked black-and-blue — crusty/salty black sear on the outside, as close to raw as you can get on the inside. I don’t usually eat my steak this way, but I greatly appreciate Chef Michael cooking it this way because he is basically staking (ha!) his reputation on the quality of the meat. You can’t cook steak this way with crap beef. The plank fries could have used a bit more crisp but were certainly enjoyable (memo to Houston chefs: there’s no such thing as too crisp fries). A side salad offered some leafy green relief. The roasted marrow bone was a nice touch. The only thing I can say about the red velvet cupcakes is that whoever sent these out of the kitchen really wanted us to taste the icing. And the icing was indeed spectacularly rich, buttery and creamy. 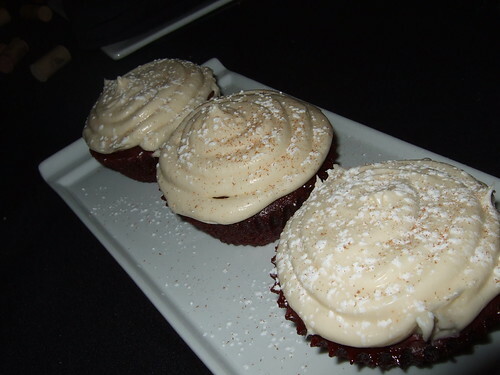 But the red velvet cake wildly missed the mark with a dense and dusty texture and plonky flavor. Hey I’m not too proud to occasionally lick the icing off a cupcake and toss the rest, which is exactly what I did here. Final thoughts? Chef Michael is obviously a creative, skilled, and passionate chef. You could tell that it really mattered to him that he and his staff put on a good tasting. That’s appreciated by a foodie like me. In general, I thought the dishes — especially the gazpacho, scallops, and bass — hit exactly the right notes for being flavorful and filling but also refreshing, seasonal, and (relatively) light for the impending Houston summer. This entry was posted in Blog Only, Food, Restaurant Reviews and tagged max's wine dive, michael dei maggi. Bookmark the permalink. Well done. Your review has made me yearn to head back to Max’s – last few times I’ve gone only for wine, as I felt the menu might have needed a little shake up. Always good, just a bit stale. I cannot wait to taste the seafood dishes…sure seems to be a huge trend right now. 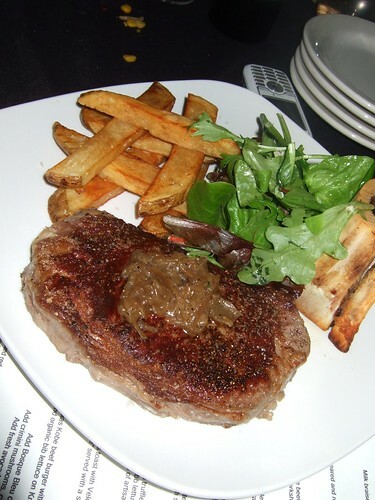 As for Steak Frites (and the quality of fries in H-town) – agreed! Doesn’t matter, day or night, warm or cold – just give it to me!!! Where would you say your fave S.F. has been in Houston? Can’t really name a good steak frites in Houston. If I go for steak, it’s a steakhouse experience. Will need to hit up a few French bistros around town for their SF. I think the chef made a good showing for your tasting! I have been there before and went back after this review hoping for a good thing close to home and the food was terrible! @Anonymous Which dishes did you have?